Chat allows you and your members to contact each other directly, outside of the group communication. Your members can use Chat if they are allowed to see each other in the Member Directory (see How can I control member privacy). 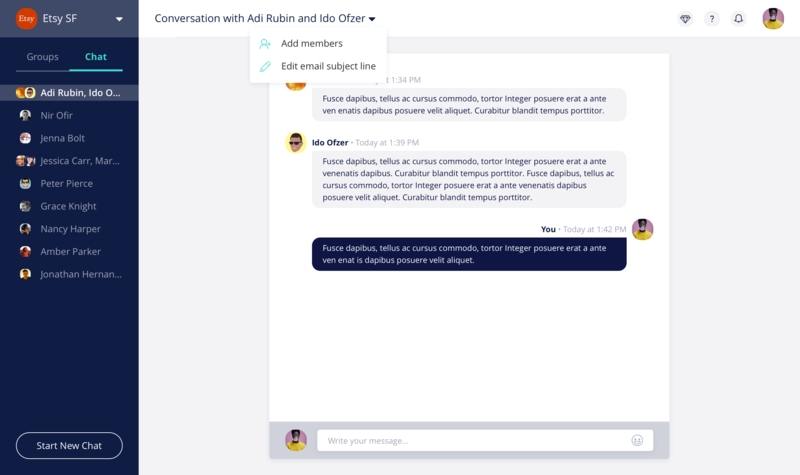 You and your members can also create chats with more than one other person. You and your members can also access this by clicking on Send message from a profile. Recipients can see chats on the web platform, in the mobile app, and via email. They can reply back in any of those three places, or they can unsubscribe from that chat if they choose. Chat emails are sent from firstname.communityname@members.mobilize.io, or in the Professional and Organization tiers with email branding, from firstname.lastname@members.yourbrand.com. NOTE: Personal emails aren't exposed via Chat.